Young Americans Schools of Self-Defense - We host several events throughout the year including several tournaments and special summer sessions and camp. 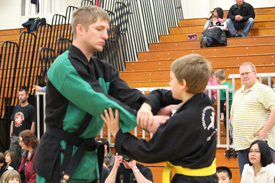 Sensei Josh is evaluating this student on an escape maneuver. Escape techniques are the cornerstone to Self-Defense. Tournaments - Our next tournament is scheduled for Saturday, December 8, 2018, at 10:00 A.M. (registration from 9:00 - 10:00 A.M.) in Jefferson Senior High School Gymnasium. Click here for our registration form and more information. Registration - Click for locations, dates and times for registration of classes for the next session, or call (952) 997-7732. Late registrations accepted, depending on availability. Wushu Camp - The Grandmaster of Wushu, Grandmaster Wu Bin, from Beijing China, oversees our Wushu curriculum. He comes to Minnesota during certain summers to conduct instruction camps in Wushu forms. Every student is a champion. 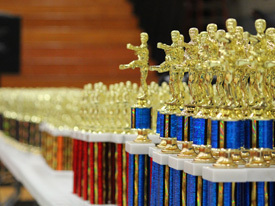 We recognize the champion in every student at our tournament and in our weekly classes. Camps are conducted typically during the summer for more information please Contact Us. Also pictured with him is his most famous student, Mr. Jet Li. Mr. Li has been a movie star for over 15 years, incorporating his Wushu expertise in all his films.